In the transportation industry, fuel economy plays a big role in controlling your Real Cost of OwnershipSM and profitability. Express Mondor is a specialized hauling company for wide loads and heavy machinery, and they found that the right engine can make all the difference. Express Mondor of Québec is a family-owned and operated business that purchased the same brand of trucks for more than 50 years. 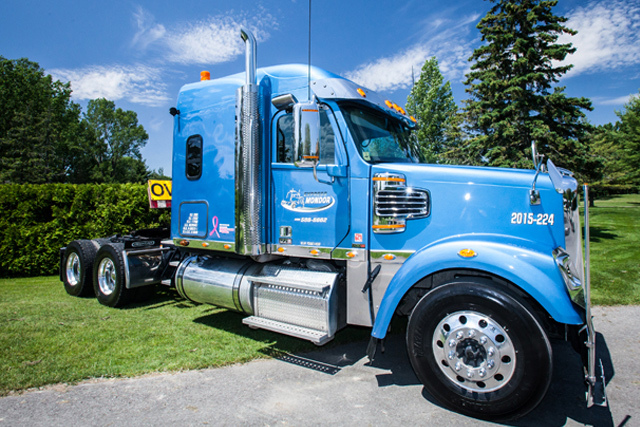 Then, Christian Bazinet, a sales representative of Globocam Montréal, Inc., came in with a new brand and a new idea to benefit their business: a Freightliner® 122SD with the Detroit DD13 engine. This engine provides up to 470 horsepower with BlueTec® SCR emissions technology, amplified common rail system (ACRS™) and a cooling system with shorter fan times to optimize fuel management and increase fuel efficiency. Within two to three months of trying a Freightliner 122SD with the Detroit DD13 engine, Express Mondor noticed a considerable improvement in fuel economy. Previously, the company’s trucks turned in around a 6.57 MPG, but since switching to Freightliner, they run at 9 MPG. That’s a 37 percent increase in fuel economy. In addition to the great customer service Express Mondor receives at home, Freightliner’s extensive dealer network protects them on the road. While headquartered in Québec, 90 percent of their transports are to the U.S. Other truck companies may have two or three dealerships in each state, but Freightliner has more extensive service coverage, including Elite Support℠ and Express Assessment. Detroit Connect Virtual Technician is an integrated remote diagnostic system that sends emails to service technicians to alert them of faults before, during, and after they occur. Mondor says that while at first glance the service may seem expensive, it turns out to be really cheap. “We can follow the truck every day, every month, and if we have a breakdown we can try to fix it right away. We save time and money,” said Mondor.